Three men have been charged with armed robbery and possession of a firearm after an ‘incident’ at Cherwell Valley Services on the M40. Anthony Gooch, 35, of Market Street, Bracknell; Mark Sorley, 33, of no fixed abode; and Sam Edwards, 25, of no fixed abode; have all been charged with two counts of armed robbery and one count of possession of a firearm. The charges relate to an incident that happened at around 8pm in the motorway service station car park at junction ten on Wednesday (September 19). 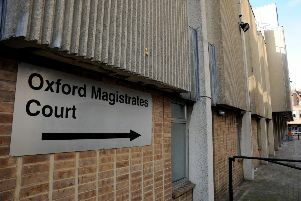 All three men appeared at Oxford Magistrates’ Court on Friday and were remanded in custody before a hearing at Oxford Crown Court on October 19. Investigating officer Detective Sergeant Mark Personius, of Force CID based at Banbury police station, said: “I am appealing to anybody who believes they witnessed this incident, or may have dash-cam or mobile phone footage, to call 101, quoting reference number 43180287311.